A draft of the report of all the work, prior to publication, will be on the site in August. The next walk round the battlefield is scheduled for 25th September, 2011. Meet opposite Fulford Cemetery at 11am. The Fulford research was presented at the leading international conference. A bit of practical historic research. To see how ancient clothing worked and how long it would take to get the news of the defeat at Fulford to Harold at Waltham Abbey. Hear a bit about it on the BBC Making History programme. If you want to understand a bit about the insane rules under which planning operates then read my recent letter published in the press. It describes two incidents when the inspector ignored reality because it was contrary to the official view. The Minister has determined that the battlefield will provide the access road to this housing development. There is a news release. Efforts must now be devoted to ensuring that the rest of the site as well as the exciting finds we have made are properly investigated before the site is destroyed. (Left) In August 2010, road signs have been erected to tell people that they are crossing the Fulford battlefield. The signs are on the A19 and are placed just to the north (the English side) and the south (the Norse side). This sign is near the place where the land begins to slope down towards the ford. Many thanks to the Parish Council for this imaginative way to let the locals know about the national heritage around them. Analysis of the finds will continue. We have now sorted through 2/3 of the finds. A great activity day took place on Sunday & Monday 18/19 February 2007 to sort the ferrous collection. Metal working tools. There are some similar items to those we have found in the city museum in Northampton. See what you think. Museum, Finds, X-ray, and now XRF analysis. The various floods have tested the evidence to the old course of Germany Beck that was revealed during soil survey work. The results are encouraging. We are now confident that we know where the beck flowed in 1066. The public inquiry into the fate of Germany Beck opened on 13 June 2006 and continued until late July. The inspector will be reporting to the Secretary of State in the Autumn. The minister has decided to approve the development and has not even required that relevant archaeological investigation is undertaken. 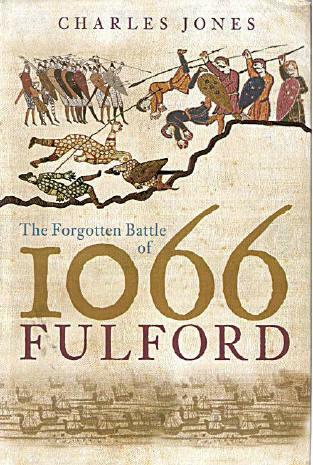 For parents and children, of all ages Chas Jones has written a book which explains the events of 1066 leading to the battle of Fulford. The book challenges much of the received wisdom about the events of 1066. The role of earl Tostig as the choreographer of the two invasions of 1066 is explored as is the routing of duke William's southern invasion by king Harold's navy. Drawing on the research that has been carried out around the site at Fulford, the course of the battle is interpreted for the first time. 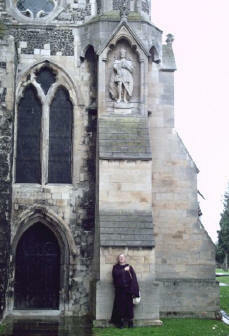 Was king Harold confident that duke William has already been defeated in an unreported sea battle before heading north? On 20 September 1066 a battle of the size and duration of the clash a few weeks later at Hastings led to the defeat of the Northumbrian army. Click on the cover to go to Amazon to purchase the book. Battlefield Trust site This is a wonderful, new resource for those who want to know about the battlefields of England and Wales. Can you help? One author has donated copies of their books for us to sell. The embroiderers are making exceptional progress with the tapestry. This was the first time that the pieces of the tapestry were all laid out together! Using the landscape analysis it has been possible to reconstruct the landscape on which the battle was fought. A table-top model has been built. The Battle of Fulford, on the outskirts of York, has been overshadowed by the other great battles of 1066 at Stamford Bridge and Hastings. 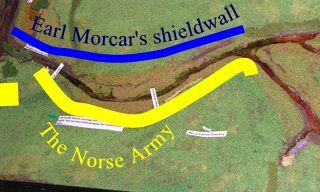 The sequence of events that flowed from the defeat of the Northern Earls at Fulford led, a few weeks later, to the Norman Conquest of Britain. Study the six map sequence that speculates on the fateful course of the battle. To convey an impression of the importance of this battle, the size of the Hastings battle site has been imposed on the Fulford map for comparison. Fulford looks bigger! A paper on the methodology adopted has been added. The underlying geology is key to placing the battlefield. History Today has kindly given permission for the article about the Battle of Fulford to be reproduced on the site. Published in October 1966, its title is "The Third Battle of 1066".